Every golf course has one  and I’m not talking about the pro, the groundskeeper or the resident gopher. Nine holes or 18, each layout has its most challenging trip from tee to pin, its No. 1 handicap hole. This is the hole on each course that takes the most strokes, on average, to play in proportion to what par is declared to be. For instance, if a par 4 on a given course averages 4.45 strokes and a par 3 averages 3.41 strokes, the par 3 is rated No. 1 handicap because it averages 113.7 percent of par, and the par 4 averages 111.3 percent. OK. There’s the math. You can check my work, if you like. Now, here are the No. 1 handicap holes on the six courses in Bonner and Boundary counties. As a serious journalist, I made it my duty this spring to visit and play each one, even though one still had a foot of snow on the fairway. Here, in order of play, are descriptions of each hole from the men’s tees. Mirror Lake’s No. 10 is an inverted arch, low in the middle; 414 yards with a sharp right turn at 380 yards uphill to a small, elevated green; water hazards right at 125 yards and left at 160. The fairway tilts left. The green is fast, humped and protected by trees, the driving range fence and a deep trap in front. Only long hitters have a chance to be on in regulation, par 4. As extra hazards, Canada geese play through. Perfect play: 220 yard drive to left side, 170 yard fade to green  you have to carry the trap and long grass on rise to green  2-putt for par. 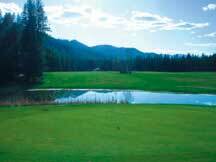 Priest Lake Golf Club’s par 4 No. 2 is slightly uphill, 359 yards straightaway. The green is small, tilted toward the front, backed by a forested hill and fronted by two hazards, a sand trap and a pond. The pond is 35 yards wide. From the pond to the edge of the green is 5 yards, much of it full of sand, so the landing area is the green. The yard markers on this recently expanded course are birdhouses. Nice touch. Perfect play: 210 yard drive right over the women’s tees, 145-yard iron shot to the front of the green (you want to be below the pin)  2-putt for par. The Ranch Club’s No. 6 is a chalk-line straight, 404 yards, par 4, uphill with trees on both sides  and a high-tension power line smack down the middle, including a tower dead center at 170 yards. USGA rules say the ball “must be replayed” if it hits a power pole or line, but local rule says the choice is yours. There is a sand trap right 50 yards off the green and another tower at the right edge of the green. Perfect play: Down the middle twice (there is plenty of room for a bouncing approach) and 2-putt for par. At Stoneridge Golf Course, No. 8 is a 218-yard par 3. The tee is about 60 feet above a large, relatively flat green, which helps with the distance, but there is sand on the right and water to the left of the green. The pond guards the left side of the green, so stay a little right if you want to hit it in one. This course was redesigned last year and features a 19th hole where you can actually play golf instead of just talk about it. I guess that makes the bar No. 20. Perfect play: Tee shot that lands in front and runs onto the green. Two-putt for par. The Sandpoint Elks Golf Course has No. 6, a 392-yard par 4 that looks pretty simple  except for the ball-magnet, out-of-bounds railroad tracks on the right. Left is also out-of-bounds, where an errant shot might take out the window on your buddy’s Buick. Fly the green and you’re in the trees. It isn’t as easy as it looks. Perfect play: 220 yards to the left side, then a 170-yard second shot that rolls onto the green. (The green tilts toward the front). Two-putt for par. No. 6 at Hidden Lakes Golf Club is a 370-yard par 4 that plays harder than it looks at initial glimpse ... a lot harder. Water in front of the tee, water, jungle or water and jungle on the right all the way, forest on the left for the first 240 yards, then swamp, water at 260 yards straight away and a dogleg left to a large, undulating green 30 feet higher than the fairway. The green, with traps on the left and right front, is set into a hillside, surrounded by trees and tilted toward the front. The green isn’t visible from the left side until about 250 yards from the tee. Perfect play: 210 yards to the right center of the fairway, 160 up the hill to the green (club up at least one, but try to stop below the pin) and 2-putt for par. The hardest of the six is hard to call, but I would say it’s a tie between Mirror Lake No. 10 and Hidden Lakes No. 6. Perfect play, of course, is perfectly impossible most of the time, so just try to hit it straight four or five times in a row, and you can at least play bogie golf. You can always make up that lost stroke on the easiest hole. Each course has one of those, too.